Vince Lombardi, Geno Auriemma & John Wooden are generally recognized by all as the most legendary coaches on the planet. 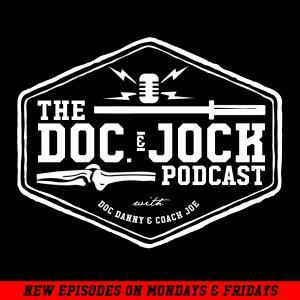 On Episode 178 of the Doc and Jock Podcast we are lucky enough to be joined by one of their coaching equals, Mike Burgener, who is regarded as the Godfather of American Weightlifting. If you aren't familiar with Coach B his story goes like this: While playing football for Ara Parseghian at Notre Dame he worked with a strength coach by the name of Father Lang. Coach Lang introduced Mike and his friends to The Lifts and used them to make them stronger for Football. In the offseason Mike would travel around the midwest competing in Weightlifting meets. After college Coach B joined the Marine Crop. afterwards he stayed in SoCal where he became the US National Team Coach which earned him a Level 5 status within USA Weightlifting. To help further the sport of Weightlifting Coach B founded the CrossFit Weightlifting program which helps train CrossFitters in the lifts. On this Episode we have a great conversation that covers the span of Mike's life in coaching. We start at the beginning with how Ara Parseghian and Father Lang shaped Mike to be the man he is today. We move into the Marine's what impact that had on his coaching style. From there we talk about parenting and how Mike parented his kids in the sport of Weightlifting and we finish up with CrossFit and geezers and how they are continuing to make Mike the man he is. -Are we soft as a nation?